The Katherine H. Van Fossen Wildflower Garden is a tribute to an environmental pioneer who had an interest in soil conservation and native plants. The garden was donated by Katherine's son, Dr. Albert Van Fossen, a retired Ohio State professor of ophthalmology, and his wife Bonnie. The garden is a collection of plants native to the United States, honoring Katherine's dedication to protecting the environment and preserving natural habitats. The wildflower garden, originally located in the Lane Avenue Gardens, was relocated to the Learning Gardens and re-dedicated with a pancake breakfast held in the gardens on June 7, 2003. The design, created by students in a landscape design course, reflects a shaded woodland site with large stones for textural contrast. While the garden contains many herbaceous and woody plants with four-season interest, the emphasis is on spring-blooming wildflowers. Many of our spectacular spring wildflowers are ephemeral and become dormant and disappear after blooming. Keep this in mind when using ephemerals in your own garden, and include non-ephemeral plants as well to ensure your garden is beautiful throughout the growing season. 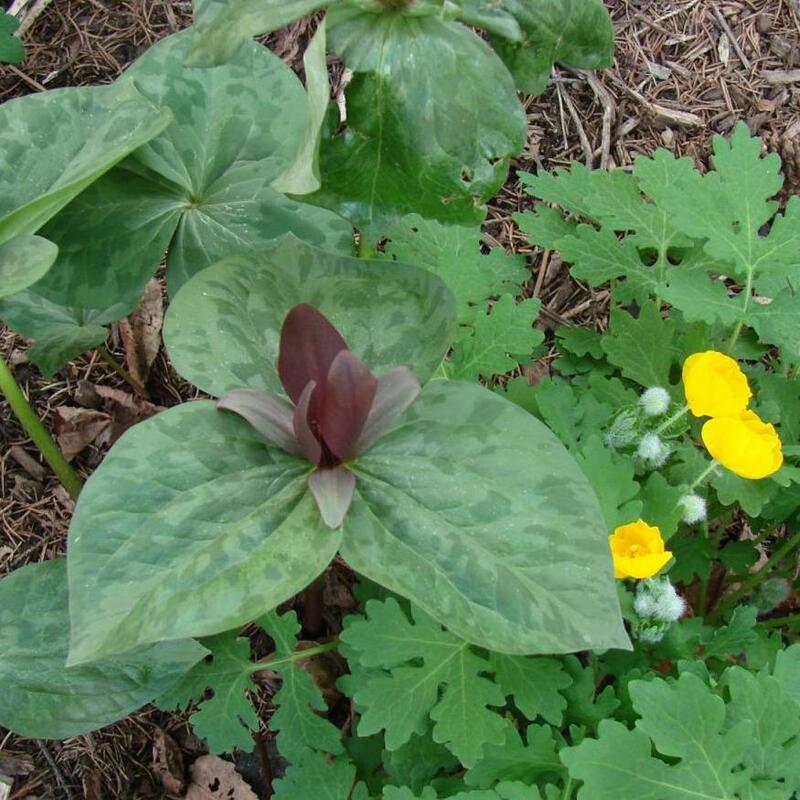 Some of our ephemerals in this garden are Trillium, Pldophyllum petatum (mayapple), Mertensia virginica (Virginia bluebell), and Sanguinaria canadensis (bloodroot). While ephemeral plants are wonderful additions to the woodland garden, they can present unique design challenges, leaving empty areas in the garden during summer and fall. Some native perennials in the Katherine H. Van Fossen Wildflower Garden that are not ephemeral and thus provide beauty throughout the growing season are Asarum canadense (Canadian wild ginger), Amsonia tabernaemontana (willow amsonia), Aster divaricatus 'Eastern Star' (woodland aster), Carex platyphylla (broad-leaved sedge), and Salvia lyrata 'Purple Knockout' (lyre-leaved sage).